Saturday, Sept. 15, 1888 Quite cool morn - & cloudy A.M. more sunshine thro' mid-day, but Mercury not above 70°. As well with our folks, till Clara pulled (wringer?) over onto her foot, hurting so she was on bed or in rocking chair most A.M. but Ch- took her in "cart" to party with Karrie at Dougherty's P.M. going for them, which with usual work kept her busy, El- occupied as usual. As well self, spending day as usual with some extra sweeping, & repairing. 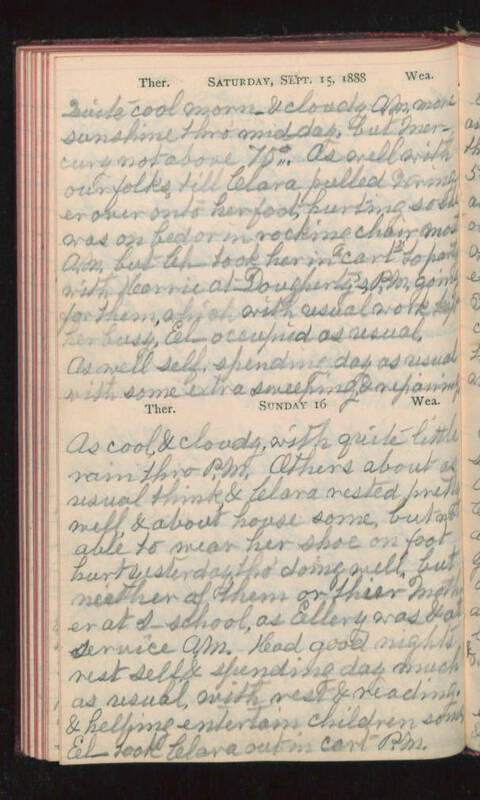 Sunday 16 As cool, & cloudy, with quite little rain thro P.M. Others about as usual think & Clara rested pretty well, & about house some, but not able to wear her shoe on foot hurt yesterday tho' doing well, but neither of them or their Mother at s-school, as Ellery was & at service A.M. Had good nights rest self & spending day much as usual, with rest & reading, & helping entertain children some. El- took Clara out in cart P.M.